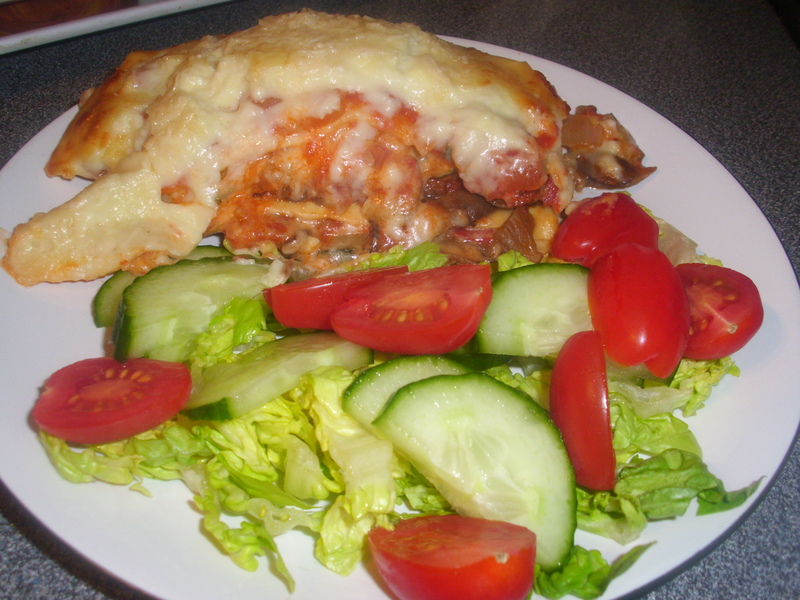 Vegetable Lasagne – better than meat! I think there are few meals that are as comforting as lasagna. Served with a crisp salad it can be the perfect balance of flavours and textures. In the past I have always chosen a beef lasagne where the option has presented and it was natural that for many years this is the type of lasagne I would make at home. Some years ago I made a vegetarian version for my daughter-in-law and, lo and behold, my husband, a confirmed meat-eater, loved it and actually preferred it to the meat version. It has been ages since I last made this but the other day I had a craving so made it for supper. Once again, my husband, who appears to have a short memory of his liking for anything vegetarian, showed his distaste then managed to have two huge helpings. Well, it is documented here so if he pulls this trick again I have written evidence. I have chosen to use mushrooms, courgettes and tomatoes as the three vegetables for my lasagne. I am sure that you can vary this with whatever you have available but would suggest that the tomato and cheese sauces play some part in the end product as they contribute to the rich flavours and moistness of the finished dish. Maybe try replacing the courgettes with some cooked chopped up spinach would be a nice alternative. I am sure my foodie followers will have loads of suggestions that I would love to hear about if you have the time. Anyway, here is the recipe. It will serve 4 people easily and warms up well for the next day. You can freeze if you use fresh pasta that has not been pre-frozen. Preheat oven to 200C/190C fan/gas 6. Put the dried mushrooms in a bowl and cover with boiling water. Leave to soak for 30 minutes. Meanwhile, heat the oil in a frying pan and gently fry the onion over a medium heat until softened but not coloured. Add the tomatoes and cook for 5 more minutes until thickened. Season with salt and pepper. In a small frying pan melt half the butter and sauté the courgettes over a medium heat until soft. Add to the tomato sauce. Drain the mushrooms and slice. Melt the remaining butter in the small frying pan and add the dried and fresh mushrooms. Cook on a high heat until they release their juices then turn the heat to low. Add the garlic and lemon juice and season. Continue to cook until most of the moisture has evaporated. To make the cheese sauce, melt the butter in a saucepan then add the flour. Mix well and cook over a low heat for a minute. Add the milk slowly, mixing between additions to a smooth paste. If it starts to curdle don’t worry, whisk and it should become smooth again. Add the cheese and the mustard, stir until the cheese has melted. Season lightly to taste. Put a little of the cheese sauce in the bottom of an ovenproof dish. Top with lasagne sheets cut to fit the dish. cover with a layer of mushrooms, followed by a layer of tomato sauce then cheese sauce. Repeat finishing with the cheese sauce. Sprinkle with the Parmesan cheese then bake in the oven for 30 minutes until golden on top and bubbling. Leave to stand for 5 to 10 minutes before serving. ← Cheese and potato pie – a really simple recipe with shortcuts!